Moving in an endless cycle, mercury goes from the atmosphere to soil, water and sediment, and then back to the atmosphere. While moving around, mercury changes to its various forms, often becoming the highly toxic and bioaccumulative methylmercury, the type that builds up in living tissue and increases in concentration up the food chain – including the food we consume. Photo courtesy of redjar, licensed under CC BY-SA 2.0. Mercury is released into the environment from both natural and anthropogenic sources. Not only are these sources continuously shifting and blending as we speak – they have been doing so for millennia. Ancient human practices, such as biomass burning for agricultural activities and extensive mining in the Peruvian Andes, have been influencing the movement and distribution of mercury well before the industrial revolution. To find mercury levels representative of natural emissions – not significantly influenced by human activity – we have to go back thousands of years, to a period of time that Bruce Hope and Jeff Louch call the pre-Anthropocene (≤2000 BCE). But why do we want to know what the mercury levels were in the pre-Anthropocene? Hope and Louch provide a clear answer in the recently published paper “Pre-anthropocene mercury residues in North American freshwater fish” (Integrated Environmental Assessment and Management, published online January 23, 2014). The neurotoxic form of mercury – methylmercury – accumulates in fish and shellfish and may cause significant adverse effects in people that consume it. Therefore, Federal Agencies along with State and local authorities regulate limits on the maximum concentrations of mercury allowed in seafood. As more information on the adverse health effects of methylmercury becomes available, the allowed concentrations become smaller and smaller. But how small is too small? Are we, in some cases, trying to bring these limits down to levels that are impossible to achieve – levels that are below those deriving from natural emissions? Hope and Louch set to find out. Natural emission levels are those present in the pre-Anthropocene. Because fish specimens and data on surface water from that period are not available, Hope and Louch estimated the pre-Anthropocene concentrations of methylmercury in the tissues of prey and predatory fish using an integrated model. This model takes into account the different forms of mercury, its transport and fate, as well as the food web – and is based on estimated concentrations of mercury in soil, sediment and atmospheric deposition. Results from the model indicate that, in some watersheds, natural levels of mercury in fish may be higher than those allowed by current regulations. On the basis of this finding, the authors suggest that alternative regulatory strategies should be developed for these watersheds. The mercury cycle is indeed complex, and our understanding of it is still incomplete, but as the Hope and Louch study shows, correct use of models may help in putting together some of the puzzle pieces, including those related to the presence of mercury in fish. This entry was posted in Environmental Policy & Regulation, Toxicology and tagged Anthropocene, mercury, methylmercury on January 28, 2014 by Integrated Environmental Assessment and Management. One of the major problems with mercury pollution is that the mercury cycle is global. The post does make an important point, i.e., background levels of mercury pollution, those due to natural causes, are almost impossible to control. It also mentions that “in some watersheds” levels are higher than currently regulations allow. The specification “in some watersheds” makes me think that there variability between a watershed and another, and I believe this is expected. I’m wondering whether or not, because the mercury cycle is so global, we can also expect variations of natural levels from time to time. My guess is that the model needs to be run very often to control for variations, and in this sense, it will be interesting to see how the results from the model change depending on different assessment times. There is certainly variability in natural (non-anthropogenic) mercury and methylmercury levels between watersheds (hence the different scenarios used in the paper) and we could also reasonably expect there to be variation over time in their natural levels within watersheds. For example, the microbial activity responsible for the production of methylmercury is affected by seasonal changes in water temperature, flow, etc., leading to seasonal changes in its level in the water column [Hope BK. Human and Ecological Risk Assessment 17(6): 1263-1278, 2011]. 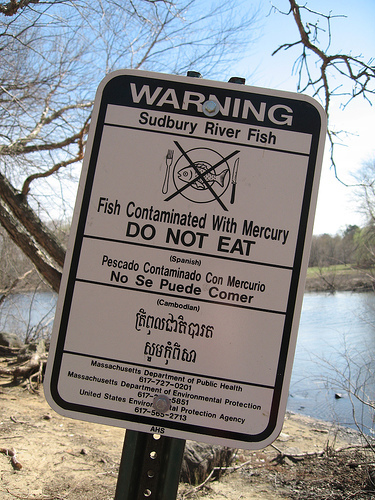 This is one reason we suggested that mercury is possibly better understood and regulated at a watershed level. Yes, the watershed level is right where it is happening, but even more to the point is that it is happening in the organisms, real physical and mental degradation that becomes population limiting. Since pointedly investigative water quality investigation is seen as being inherently politically subversive by legislators, funding toward ‘better understanding and regulation at the watershed level’ is not very often going to get adequately funded or regulated. Water quality monitoring is essential, it is what saves money in the long run. Not doing it adequately is what has gotten us into degraded conditions in the first place. Water quality responsible agencies fear punitive cuts to other good work that they are able to get done if they ‘make too many waves’ by finding new water quality problems that might require the legislature to find funding to fix. Agencies, that are staffed with the best intentioned people coming out of college, are hamstrung by this political paradigm and can’t adequately do their jobs at the watershed level. Environmental monitoring is essential to ‘ground truth’ models or models continue to be wrong. Monitoring is essential for the scientific method and intellectual integrity, yet does not begin to approach the levels that are needed to do a good job of funding prioritization and project prioritization. As a result the watershed level ‘understanding and regulation’ is often misinformed and opportunity for scientific, ecologic, and fiscal responsibility is lost. How can we get the legislative arm to see that longer term gains are essential and will save us money. They, think that agencies should not do stream chemistry assessment on a wartershed basis because it costs too much, when it really is very cost effective by being the basis for effective prioritization that is otherwise often misinformed and leads to more costs. Environmental monitoring saves money and is essential, legislatures are who we charge to fund that which is essential. A major question remains to be clarified about ‘natural’ levels of Hg and MeHg. If forests sequester considerable mercury, and release it when forest fires pass through, I have often heard it said that this is a non-anthropogenic source that we can’t do much about, therefor, let’s concentrate on anthropogenic source control. However, the forest-sequestered faction probably has been greatly increased by anthropogenic dispersal for hundreds of years via such dispersal as mined mercury being put into thermometers, lightbulbs, and mercury amalgam. Structure fires and cremation have likely caused very significant anthropogenic influence on forest mercury content, this is hardly ‘natural’ since it was mined from concentrations sequestered in the earth and then dispersed in products, to become subject to atmospheric dispersal into the forest. I never hear of the amalgam/cremation sourcing targeted for mitigation, or even for quantification. What is the ‘real’ natural background level in the environment? I’ll bet that it is not accurately estimated. Forest fires have been shown to release sequestered mercury – which in current times likely came from both natural and anthropogenic sources. This is why in our paper we made estimates of “…the real natural background level…” (i.e., the pre-Anthropocene level) based the considerable work in recent years with dated sediment and peat cores, with timelines extending back hundreds to thousands of years. We used these core data to estimate mercury levels in soil, sediment, and air deposition. We feel that there were enough such studies to give us a reasonably accurate estimate of what was happening with mercury before humans got into the act. Were any of these studies done with dendrochronology? Tree ring data goes back quite a ways in many locations, could these archived biochronologies, together with paleo wood provide a much broader basis for assessment and correction of a model? It might be that sediment and peat cores would turn out to be less accurate? Would the dendro provide better or more controlled aging to the data? There are studies of mercury uptake and translocation in trees but I’m not aware of any that tried to date the results. One problem is that the connection between the deposition rate of Hg on a soil or sediment surface and the amount of Hg that is eventually stored in a tree could be a complicated one. If the goal, as was ours, is simply to estimate the deposition rate, then sediment or peat cores are the preferred approach. Since there is some controversy over which is more accurate – sediment or peat – we used both. Makes sense, I guess I was just pushing it a bit further into bioaccumulation potentials over time and space. I think that the University of Arizona has a good denrochronology program that might be a good resource for a further look into feasibility of historic and paleo MeHg presence. I agree. Sounds like a good research opportunity for an enterprising grad student. Roberta and Bruce—nice summary and nice article. I can think of additional ramifications from this research and paper. 1) This paper supports the idea that there is no such thing as a reference site, a location in the landscape that except for anthropogenic inputs represents a standard condition. As this research demonstrates there is no standard condition. Instead there are a variety of gradients depending upon the stressors that are being evaluated. 2) If variability is the case for Hg it is also true of other metals and other materials in the environment. 3) However, the variability of concentrations of Hg and other materials in the environment does not mean that we cannot assess risks due to anthropogenic inputs. It does mean that the gradients within the environment do need to be quantified, the variability described, and the risk estimated using that information. Good points. As to point #2, metals other than Hg may also exhibit variability due to their chemical nature, but Hg brings with it the additional variability associated with the biological processes controlling methylation. So differences among watersheds may be as much due to differences in methylation conditions as they are to differences in loadings – perhaps more so. I agree that methylation differences are important in determining the variability between watersheds and within a watershed. Given the differences in available nutrients from different landscape uses, differences in substrates, and differences in temperature within even in a few kilometers of rivers that we have studied I suspect a considerable variation within a watershed. Since sediment, water and biota move, the higher concentrations may be well downstream of the anthropogenic or natural source. I belive that environmental assessments of MeHg in fish have demonstrated very widely dispersed contamination that is bioaccumulating in fish. It’s everywhere, but of course, more prevalent in some areas. The Oregon Fish Consumption Rate Process documented widespread contamination across the PNW. We know that atmospheric dispersal is dominant and pervasive. Hot spots superimposed over this wide dispersal, such as mining area stream contamination of elemental mercury, feed ongoing methylation as the elemental Hg slowly moves downstream. Crematoria, that volitalize huge quantities of mercury amalgam, probably don’t filter out the resultant contamination, and there may greatly increased dispersal. Landfills must be leaching very large amounts of mercury to shallow groundwater, and surface runoff to streams and rivers. Yes, there would be local variability in concentrations, but the atmospheric dispersals from asia, from forest fire mobilization of sequestered legacy anthropogenic sources (e.g. coal burning) constitute a massive widespread environmental degradation that pervades public health and health of wildlife across the entire landscape. Immune functions are depressed allowing widespread pathogenicity, additively and synergistically. We are in deep doo doo. This is just one toxic metal of many. Sure we should be paying attention to hot spot dispersal, but we should not ‘throw out the baby with the bathwater’ by allowing the ‘normalization of creeping acceptance’ of widespread dispersals and subsequent numbing of public and medical health assessment. We can’t continue to focus so much on symptom abatement medical practices while politically avoiding pointedly investigative causation determinations. Pharma thrives on the politics of symptom abatement economy, societal well being degrades on avoidance of causation determination. The long term well being is primary, contaminant sourcing of production and dispersal irresponsibility is the ultimate driver we need to keep prominently in focus as we strive to move into a more sane future. I just googled crematoria and mercury to find interesting dispersal information. This sourcing is certainly an important one, and increasing rapidly. Hopefully, this will taper off as many of us older folk pass on, and younger people with better dental care use less mercury. On another note, EPA lab protocols for water metals determinations require that lab techs wear masks so as to reduce mercury contamination from exhalation of mercury onto the samples.